In last week’s message, Pastor John tackled the hard-hitting subject of debt. This week, he talked about our extra. Whew…a lighter subject, right? Wrong. This may have been one of the most convicting messages I’ve ever heard. And I am grateful for it. Do you go out to eat even when you have food at home? Do you have a car? More than one? Cell phone? Seasonal wardrobes? More than one closet full of clothes? Extra freezers? Have you ever traded something in for an upgraded version, even if it wasn’t broken? “De” is a Latin word meaning down to the bottom, or completely. So the word “deserve” means to serve oneself completely. It doesn’t negate serving altogether, it just means that the only one we’re serving is ourselves. We looked at the parable Jesus told about the rich fool in Luke 12. The ground of the rich man had produced a massive crop. There was so much extra, he had no place to store it all. He mistakenly assumed that the surplus was because of him and for him and he intended to hoard it all and spend the rest of his life eating, drinking and being merry (vs. 19). He took the posture of one who believed he deserved all that he had-and he aimed to serve himself completely with his extra for the remainder of his days. There was just one problem with his plan-he died that very night. And he went down in history as a fool. That became his legacy. In the case of the rich fool, his surplus was given to someone else after he died. He just wasn’t around to be part of it–but it wasn’t because of his generosity that others benefited from his extra. This is the case with possessions-we only have them until we’re gone. Then someone else becomes the beneficiary of all of it. But what about everything else? What about all of the extra we’ve been given that isn’t stuff? What about our time, gifts, position, privilege, status? What about our love, joy, peace, patience, kindness, goodness, faithfulness, gentleness, and self-control? Is all of this not also extra? Do our hearts hoard these things? Do we serve ourselves completely with all that God has given us? These things don’t remain once we take our last breath, like our possessions do. When we die, if we’ve chosen to hoard this kind of extra, it all dies with us. That is a tragedy. We have to begin to see these things as part of our “extra” so that we don’t waste all that we have been given. We wrongly assume that if we have more, we can do more for God. John reminded us on Sunday that it’s not what we have, but who we have that allows us to “do” anything for God. God has given Himself fully to us. He gave us life-twice; He gave us physical life-the breath in our lungs-and He gave us eternal life through the gift of His Son. He put His Spirit within us, providing fruit in our lives as well as gifts and talents and strengths that are unique to each one of His followers. He provides for our daily needs and exceeds them, giving us more than we know what to do with. And He has chosen gladly to give us the kingdom. Pastor John said to us, “If the kingdom matters to you, you’ll leverage everything in your life for the kingdom”. Above all else… As John asserted in his message, we don’t have the capability to “balance” multiple priorities. Balance only comes when we have only one priority. The right priority. His Kingdom. 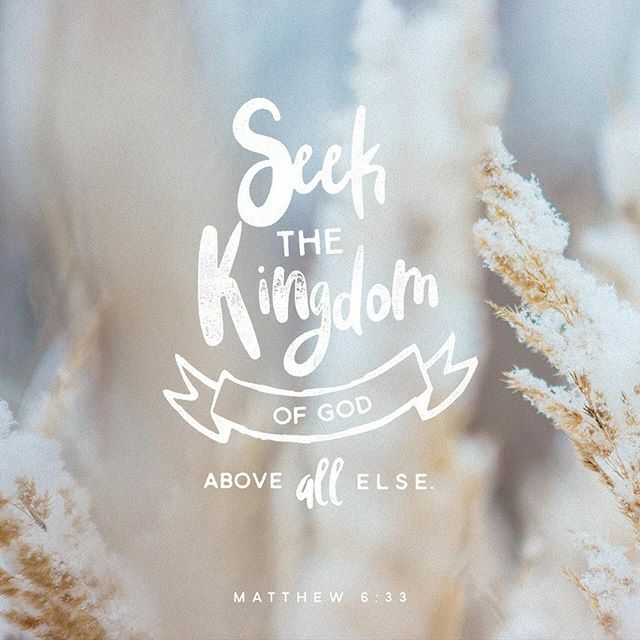 If we want to find balance, we must prioritize His Kingdom. And just as He has given Himself fully to us, we must give ourselves fully to Him in return, knowing that our lives are not about what we have, but who we have. What has God given you? What has He given you in abundance? What gifts and abilities are being hoarded in your heart with no outlet, no place to go? God gives us more than we need, more than we can hold, so that we will open our hearts and our hands and share our abundance. So we can serve-because we actually don’t deserve any of what we’ve been given. If we are willing to give ourselves fully back to Him, then all the good that we have, everything we have been given, becomes a vehicle for spreading Kingdom seed. Will we choose to surrender everything into the hands that have so graciously given everything to us? Will we leave a legacy that resembles that of the rich fool or one of someone willing to be scattered throughout the world as seed that will grow and impact the Kingdom of God for generations to come? I echo Laura’s “ouch!” Like Laura, I was deeply convicted during Pastor John’s message. Given the silence in the sanctuary, I think many of us were. Our cultural mindset, and our flesh nature lead us to believe that our lives are all about us, and that we have to look out for “#1”. The definition that Laura shared with us about “deserve” is sobering. Our self-serving gets us no-where good, and it is absolutely contrary to the heart of God, yet we try to make our greed work for us somehow. Bless me Lord I pray. Grant me what I think I need to make another day. Make me wealthy. Keep me healthy. On my never-ending shopping list. It’s a funny song, and it’s not. It’s not, because it is the Christianity of many of us. “Me, me, me, me, me.” Yet God says, lift up your eyes, look outward with a heart of love– live for my Kingdom and I will supply all you need. He makes it clear what we are to do with our “extra”. That’s a pretty clear directive from God. Ruth, the Moabite benefitted from this practice. It’s how she provided food for her mother in law, Naomi, and herself. In Ruth 2:2 she asks Naomi “Let me go to the fields and pick up the leftover grain behind anyone in whose eyes I find favor.” The last phrase of her request is interesting. It indicates that some of the land owners followed God’s directive, and some did not. Boaz did. Boaz’s generosity toward this foreigner led to their marriage, and led to Ruth being one of the five women mentioned in the genealogy of Christ. In the New Testament we see a beautiful example of generosity in the life of Tabitha. Tabitha was a woman who used her “extra” to bless the poor and the widows, and God esteemed her ministry so much that he used Peter to raise her from the dead! I could go on and on. There are also scriptures that are pretty clear about greed. Jesus sat down near the collection box in the Temple and watched as the crowds dropped in their money. Many rich people put in large amounts. Then a poor widow came and dropped in two small coins. Jesus called his disciples to him and said, “I tell you the truth, this poor widow has given more than all the others who are making contributions. For they gave a tiny part of their surplus, but she, poor as she is, has given everything she had to live on. Jesus loves generosity. Generosity is a beautiful reflection of God’s heart, God who gives, and gives, and gives, and gives. Everything we have comes from Him. Not only our material possessions, but all the food we eat, because he supplies dirt, sun, water, and causes things to grow–all of our modern conveniences because He supplies wind, sun rays, electric currents, etc. He has provided our personalities, our gifts, our brains. He provides the air that we breathe, the hearts that pump life blood through our bodies. It is all His. True God-like generosity is something that we will all wrestle with. I look at my possessions, some of which stay in closets, and think about the money that was spent on those things. It would be easy for me to beat myself up over how many “extras” I have, but the better idea is to acknowledge my greed as sin, confess it, embrace God’s forgiveness, and move forward making different choices from this point on. Holy Spirit, help me to remember! People were more important than things. Community was more important than individualism. God was praised. People came to know Jesus as Savior and were reconciled back to God. Can we, the capital “C” church get back to this? Only if we choose to leverage our lives for the Kingdom of God, seek His Kingdom first, and live generously. Lord, help us to recognize our idols for what they are, help us to have the courage to destroy them, help us to have the courage to fully submit to You, and help us not to wait for someone else to go first. May we be a people who love You well by loving others well–in action and deed.